Most of the time I don't miss vegetables that aren't in season but one thing I'd love to eat all year round is new potatoes. I'm sorry to say I get quite excited when I see new potatoes in Tesco and can enjoy them with melted butter and mint or as part of a potato salad. 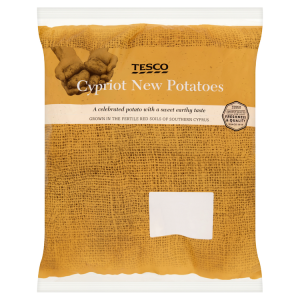 Well, now you can get new potatoes in winter, courtesy of the sun-soaked island of Cyprus. Tesco have started stocking the 'spunta' variety which are really versatile - they can be boiled, steamed, roasted or baked and you don't need to peel them so preparation is minimal! You can even grate them, as I have done in this recipe; even when par-boiled the potatoes are still nice and firm. For this recipe I thought about what I associated with Cyprus, thinking back to a holiday I had there about 12 or 13 years ago. The things that stood out to me were lamb, feta cheese and pitta breads, so I decided to make some lamb and Cypriot new potato patties and serve them with feta cheese inside homemade pitta breads. You can buy read-made pitta breads for this recipe but don't be afraid to have a go at making your own pitta bread if you haven't before, it's super easy and they taste amazing straight from the oven! Begin by making the pitta bread. If you have a freestanding food mixer with a dough hook, put all the ingredients for the pitta breads in the bowl of the mixer and run it for ten minutes until you have a pliable ball of dough. Alternatively, mix the ingredients in a bowl and knead on a lightly floured surface for 15 minutes then return to the bowl. Cover the bowl with clingfilm and put in a warm place for an hour until the dough has doubled in size. While the dough is proving, make the lamb and potato patties. Bring a pan of salted water to the boil and simmer the potatoes for 15 minutes. Transfer to a bowl and cover with cold water and leave to cool; change the water a couple of times as you feel it getting hot as this is the quickest way to cool the potatoes. Grate the parboiled potatoes - you don't need to peel them - into a bowl. Beat the egg and mix in. Grate the onion and crush the garlic and stir in, then stir in the minced lamb. Season with salt and pepper. Finally mix in the oregano, cumin and coriander until well combined. Put the breadcrumbs into a shallow bowl. Form the mixture into small balls and roll in the breadcrumbs, then gently flatten the balls until you have patties about three quarters of an inch thick. Press each side in the breadcrumbs again to coat. Repeat until all the lamb and potato mixture is used up. When the dough for the pitta bread has had 40-45 minutes to prove, pre-heat your oven to its highest setting and place a pizza stone or flat baking sheet into the bottom of the oven. When your dough is ready to use, separate into 6-8 pieces of the same size and roll out flat on a lightly floured surface into the shape of pitta breads. Place them (you will need to do this in two or three batches) onto the hot pizza stone or baking sheet and bake for 5-10 minutes until risen. You will literally see them puffing up in the oven and start to brown then they are done. Remove from the oven and leave to cool. Heat the oil or low-fat cooking spray in a frying pan and fry the lamb and potato patties on each side until golden brown. Slice open the pitta breads (careful of the steam that will escape!) and spread 1/2 tbsp. plain yogurt into each one. Fill each pitta with a couple of the lamb and potato patties and crumbled feta cheese. Enjoy hot with a green salad.